When Meghan Markle aka the Duchess of Sussex was still dating Prince Harry of England, I was obsessed with the way she dressed. I loved how her looks were both very casual and laid back but still fashionable at the same time. One particular look that I loved was during their first public outing at the Invictus Games in Toronto, Canada. She was wearing a white button-down shirt, distressed jeans, flats and was carrying this brown leather tote, which was identified as the Day Market Tote in Cognac by Everlane (priced at around $175). I was obsessed with that bag! For one, I’ve always been more a fan of totes than small dainty bags. I feel like I always need to bring along too much stuff so small bags are out. Whenever I do bring one of those small bags out of necessity, you can bet that those bags are crazy stuffed and busting at the seams because I can’t minimize the things I bring along whenever I’m out. But I digress. We were talking about Meghan Markle’s bag, the Day Market Tote, Of course, I cannot afford to buy a bag like that and honestly, I’m not particularly keen on buying expensive bags because even if there were ever a time that I could afford it, I would probably wreck that bag anyway. I’m just not the dainty type. It’s more about the look and function instead of the brand name and the presumed quality for me...which brings me to my point: I wanted the same look, just without the high price that would make me vomit if I were ever to ruin the bag in some of my usual but random clumsy accidents. I found the right bag for me via the brand Thomas Laureti (zero waste friends: the package was delivered in a box. I was so happy that they did not use plastic). OK let me invite you to my confusion when I say this because I don’t understand myself: the bag is branded Percy Laureti, but the brand’s site that I got the bag from is called Thomas Laureti. For the purpose of clarity, let me just call the bag the Laureti from now on. The Laureti bag I found was the 2 in one bag. 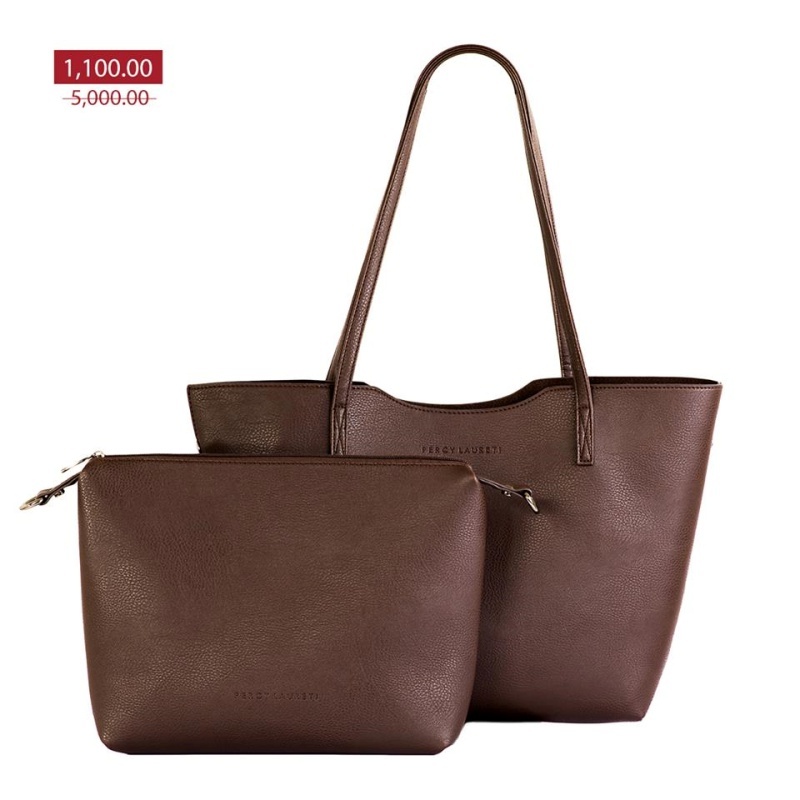 It’s a brown bag that is similar to the Day Market Tote, the only difference is that it has a matching bag that you can use as a pouch bag or shoulder bag. For the price I thought that it was a very good and practical purchase. I also found another bag, the reversible. 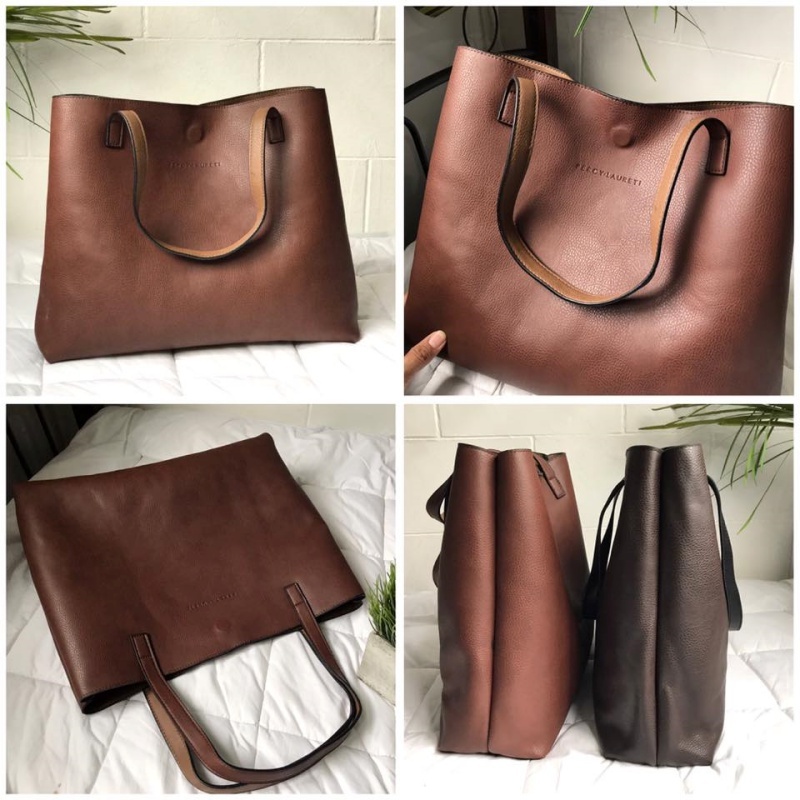 This one is also similar in look and size as the Day Market Tote but the difference is that you can use both the inner and outer color of the bag. I chose the brown and black version instead of the two shades of brown. I’ve been using the 2 in one bag daily for work. I find it practical because I use the tote to put my papers in it when I have to go out for a meeting. It’s also large enough for me to put everything I need in it for the day. The smaller bag I haven’t had much use for (because I hardly use small bags) but it’s been handy when I need to bring a smaller bag for certain occasions. While I love the bag, disintegrating little by little through time. The inner lining of the bigger bag flakes a lot so everything gets brown specks on it whenever I put it in the bag. The outer lining in the edges (have no idea what they’re called) keeps flaking off as well. I guess this is normal wear and tear since I use the bag daily but it’s sad to see it practically wasting away. I wonder if this can be fixed because I love this bag. The smaller bag, on the other hand, still looks brand new because I hardly use it. I love that this one has an inner lining – which means that it doesn’t flake on the inside. Maybe one of these days I can find more use for this one. As for the reversible bag -- surprise! It’s been more than two years (I think) and I have NOT used it yet! I’ve been so used to the 2 in one tote that I have not gotten around to using this one. Will post a review on it when I do. But for now, I like looking at it because it still looks new (hahaha). If you’re interested in these bags, there is a Thomas Laureti page on Facebook. They have a website but lately my malware scanner has been telling me that the site is compromised so I won’t share that one! Hope they fix it soon!